This week’s featured post: “6 American Problems Republicans Aren’t Trying to Solve“. Tuesday was the 150th anniversary of the Gettysburg Address. The NYT’s Disunion blog has been following the Civil War “as it happened” with a 150 year time lag. Its coverage of the Gettysburg Address emphasized how the speech’s meaning has changed through the decades. At first, the world really did “little note nor long remember” what Lincoln said. By the 1890s, however, when the Gettysburg Address finally entered America’s secular gospel, most people conveniently forgot what Lincoln actually attempted to convey in his brief remarks. During that early-Jim-Crow era, the address was interpreted as a generically patriotic honoring of the war dead. The “new birth of freedom” was played down, and the speech was read at Blue/Gray veterans’ reunions commemorating the heroism of soldiers on both sides. It would take several decades before the modern civil rights revolution compelled most white Americans to reacquaint themselves with the ideological aspects of the Civil War. In so doing, they would come to rediscover a speech that was first forgotten, then remembered and finally, a century after its delivery, understood. Friday was the 50th anniversary of the Kennedy assassination. For many people in my generation, JFK’s assassination is the first news story we remember. I was in second grade, and my grandfather had died just a few days before. The assassination happened on Friday. Sunday after church my family gathered at my grandparents’ house to discuss what my grandmother should do next. The grown-ups had their serious conversation in the kitchen, and they parked me in front of the TV in the living room, where I watched Jack Ruby kill Lee Harvey Oswald. When I ran back to the kitchen to tell people what had happened, no one believed me. I was confused, they explained. Oswald had killed Kennedy; no one had killed Oswald. Culturally, the assassination marked the real beginning of “the Sixties”, a period of generational rebellion when all received wisdom had to be re-examined. For me personally, the lesson came through loud and clear that first weekend: You have to trust what you’ve seen with your own eyes, and not what your elders tell you. a triumph. It contains nothing that any American, Israeli, or Arab skeptic could reasonably protest. Had George W. Bush negotiated this deal, Republicans would be hailing his diplomatic prowess, and rightly so. a first step. In a year’s time, it may be seen as a small step and a brief, naive step at that. But for now it’s a step rife with historic possibilities; it’s a step that should be taken with caution but also with hope and gusto. The ongoing abuse of the filibuster should not be news to Sift readers. I’ve covered it here and here, as well as considering the larger issue of how we are slowly losing the cultural norms that make our republic work. It would be an act of political negligence, and of negligence to the constitution, for [Majority Leader Harry Reid] to allow the minority to nullify vacant seats on the judiciary, simply to deny the president his right to leave an ideological imprint on a court. The logical extension of the GOP position — that “there is no reason to upset the current makeup of the court” — is a semi-permanent suspension of all appellate and Supreme Court confirmations. So rather than asking why Reid finally did what he’s been threatening for years now, the better question is: Why did Minority Leader Mitch McConnell push him over the edge? Republicans probably could have gotten away with continuing to nudge Obama’s nominees further to the right. (They’re already pretty moderate now. None represents a radical revisioning of the Constitution comparable to Bush nominees like Janice Rogers Brown.) But simply revoking Obama’s constitutional prerogative to appoint judges was an obvious slap in the face, just one step away from the Birther position that Obama isn’t really president. Obviously Democrats couldn’t let that stand; so why do it? Beutler believes that the recent ObamaCare-rollout-related dip in the Democrats’ favorability has encouraged Republicans to believe that they’ll retake the Senate in 2014. Getting Democratic fingerprints on the nuclear rule-change precedent, will provide Republicans the cover they’ll need to eliminate the filibuster altogether in January 2015. Even if that turns out to be the case, the filibuster needs to go. It has become part of the larger conservative strategy of minority rule (outlined here), which has been undermining the foundation of the American republic. If Republicans gain short-term power by winning elections, so be it. In the long run, they are trying to hold back the tide, which they can only do by ruling from the minority with tactics like the filibuster. Today, the political system changed its rules to work more smoothly in an age of sharply polarized parties. If American politics is to avoid collapsing into complete dysfunction in the years to come, more changes like this one will likely be needed. Let me be clear: The Democratic playbook of double standards, broken promises, and raw power is the same playbook that got us Obamacare. We don’t want a repeat of what’s going on now with Obamacare. That bill, constructed as it is by the Senate, last-minute-ditch effort to get it across the finish line … let’s be mindful, Madam Speaker, of what happens when you put together a bill like Obamacare and the real consequences to millions of Americans right now, scared that they’re not going to even have health care insurance that they have today come January 1. And Senator Cornyn dismissed the Iran nuclear deal (discussed above) as a distraction from ObamaCare. Speaking of minority rule, that’s what’s behind this crazy idea that is popular among conservatives, but flying below the radar of the general public: repealing the 17th Amendment, the one that lets the people elect senators rather than having them chosen by state legislatures, as they were until 1913. ALEC, the corporate shadow government behind recent moves to suppress the vote, break the public employee unions and pass stand-your-ground laws, hasn’t gotten fully behind a repeal, but wants to chip away at the 17th Amendment by allowing legislatures to add nominees to the ballot, circumventing state primaries. Whether you want to repeal or just sandbag the 17th Amendment, the point is to gerrymander the Senate. 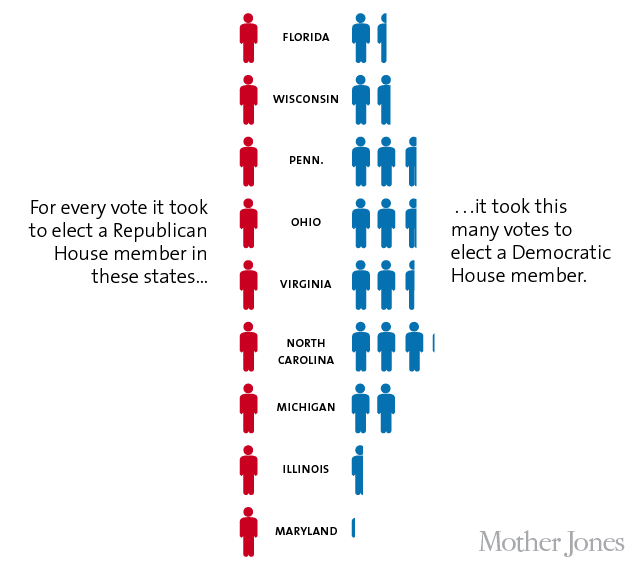 The reason Republicans control the House isn’t because the voters want them to. (Democratic House candidates got 1.3 million more votes than Republicans in 2012.) It’s because Republican legislatures in many key states (like Pennsylvania and Wisconsin) have drawn House districts to segregate Democrats into a few districts. Similarly, the districts of state legislators can be gerrymandered, which is probably how a blue state like Michigan can have large Republican majorities in its legislature. So if the 17th Amendment were repealed, a gerrymandered legislature could pick the state’s senators. So long, Democratic senators like Carl Levin (re-elected in 2008 with 63% of the vote) and Debbie Stabenow (59% in 2012). I feel vaguely ashamed of my interest in the further adventures of George Zimmerman. The important issues are racial bias in the justice system (I outlined the evidence of it here) and laws that encourage citizens to shoot each other (Ohio‘s House just passed one Wednesday by a 62-27 vote), not what kind of guy Zimmerman is. But here’s why I find Zimmerman’s run-ins with the law so hard to ignore: During the trial that acquitted him for killing Trayvon Martin, the right-wing and left-wing media painted two very different pictures of Zimmerman. Right-wingers presented Zimmerman as a public-spirited man who just wanted to keep his neighborhood safe. Left-wingers (like me) saw him as a violent man who went out looking for trouble and found it. Monday, police arrested Zimmerman in a domestic violence incident, the second such run-in (with two different women) since his acquittal. He has been charged with assault. What’s striking are the two 911 calls, one by his girlfriend to get the police to come, and the other by Zimmerman after the police arrive but before he lets them into the house “because I want people to know the truth”. In his call, Zimmerman concocts a story in which a conversation about his girl friend’s pregnancy (which she denies) leads to her “going crazy” and destroying stuff. Why she wrecked her own stuff and then called the police on herself is unclear. Zimmerman is a liar and a habitually violent and frequently out of control man who should never have been allowed to possess a gun. Watching that, to my eye, it’s obvious what kind of person Zimmerman is. I know that guy. He has no self-doubt. He could have done what I described and rationalized himself as being in the right, no sweat. Conservatives, he writes, “are dead suckers” for that Oliver-North-style “earnest self-righteousness”. Liberals have a deep-rooted skepticism about [earnestness], because we think that one needs self-doubt to check one’s self. … [C]onservatives are far too credulous about it, which makes them too supportive of the smug and self-righteous. And they never seem to learn. John Boehner tried to make a stunt out of his attempt to sign for ObamaCare. But then he succeeded. Probably got a good deal, too. 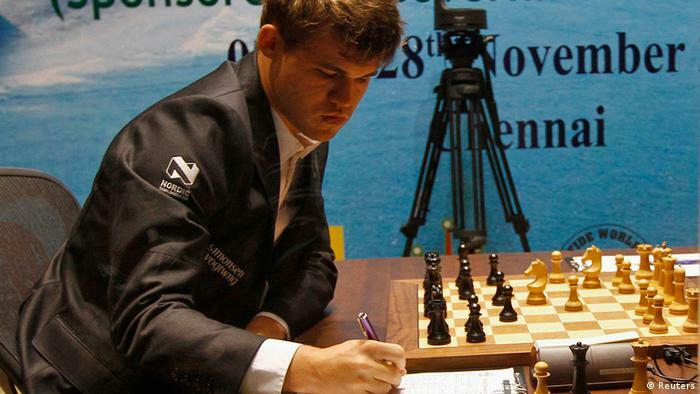 There’s a new world chess champion: 22-year-old Magnus Carlsen of Norway. His resemblance to Good Will Hunting is just a coincidence, despite the April Fool’s article a few years ago that claimed Matt Damon as Carlsen’s American cousin. The First Thanksgiving story is a little less heart-warming from the other side. I get embarrassed whenever somebody posts a map of the states that haven’t accepted the federal government’s offer to expand Medicaid. Most of them are where you’d expect: in the South and the Great Plains. But there’s a little island of hostility to the working poor in the Northeast: Maine (where the legislature has passed Medicaid expansion, only to see the state’s Tea Party governor veto it) and my own state of New Hampshire. New Hampshire got hit by the Tea Party sweep of 2010 worse than most states. For two years we had one of the most far-right legislatures in the country, with the power to override the governor’s veto on many occasions. Fortunately we reversed that in 2012, with Democrats regaining control of the House and getting the Republican Senate majority down to 13-11. Well, this week the Senate Republicans held together and rejected Medicaid expansion 13-11. From a state’s point of view, this is free money. The federal government is committed to pay 100% of the cost for three years and 90% thereafter. By shrinking the number of uninsured people who show up in emergency rooms, Medicaid expansion lowers costs for both the state and its hospitals. By helping people stay out of bankruptcy — medical bills are among the primary causes of bankruptcy — the program benefits a state’s economy across the board. And the primary beneficiaries are the working poor, people who ought to have everyone’s goodwill. We’re not talking about the stereotypic bums who want a free ride. Medicaid expansion applies mainly to people who make 100-133% of the federal poverty line: up to $30,675 for a family of four in 2012. In other words: households juggling several part-time minimum-wage jobs, and probably working harder under worse conditions than most of the rest of us. Arkansas and West Virginia are enlightened enough to see the sense of Medicaid expansion. New Hampshire isn’t. The shame, the shame. The Christian Right isn’t just anti-science, they’re also anti-history. Alternet’s Amanda Marcotte lists “5 Christian Right Delusions and Lies About History“. Sabadell is an old city in the Catalan region of Spain, not far from Barcelona. In the public square, a girl puts a coin in a hat to see what a frozen cellist will do. She gets a whole orchestra. I’ve pointed to musical flash mob videos before. I find them wonderful and inspiring. They act out the old fairy-tale theme: If you start something, unexpected help may show up. But as the “Tomorrow Belongs to Me” scene from Cabaret shows, that primal human power can work for either good or evil. Where does a generation of children first grasp the viral magic of the larger community: in the creation of beauty and wonder, or in the transmission of hatred and destruction? That’s one of those underlying cultural questions that determine a country’s political future.